Damnit! I should never have written that story about 3D glasses. Now Cyclops, the god of corneas, has vehemently expressed his displeasure. You see, I used to wear glasses of the Extremely Correctional kind. But three years ago I had laser surgery, and bingo! My naked eyes could suddenly make out individual leaves on trees that were way over there. So when I went to a 3D movie the other week, I slid the cinema glasses onto my nose easily and contentedly watched the movie in sharp resolution. The simplicity of it reminded me of all the times I used to struggle with half-an-octopus worth of glasses arms at the cinema. So that’s what I wrote about. If only I’d written about how elated I felt at not having to do that anymore or how thrilled I was by the clarity of my new 3D experience. Perhaps Cyclops would have been appeased. But since I tapped out that ludicrous tale without a hint of such gratitude, I have clearly invited his wrath. 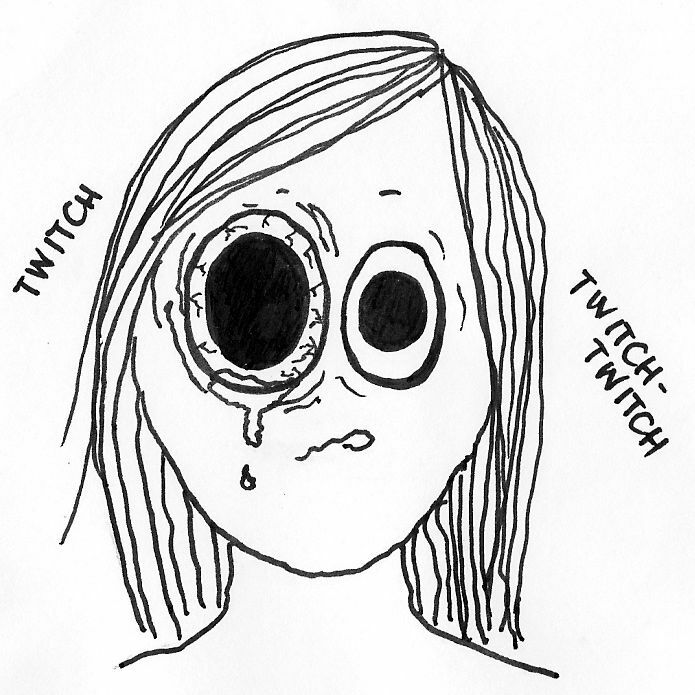 Four days after that post, he struck me with a terrible eyeball malady. 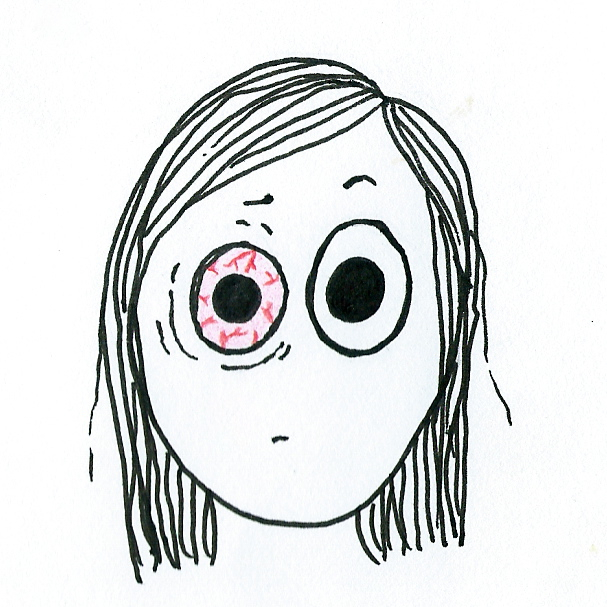 It began in the morning with a constant gritty itch in my right eye. I put in some eyedrops to wash the irritation away. But it didn’t go anywhere. I kept looking in the mirror, expecting to find an eyelash. Or dust. Or particulate matter from some long-exploded star. But I couldn’t find anything, and the irritation kept getting worse. And worse. Come lunchtime, it was so bad I went to the doctor, hoping he might be able to flush out the mystery irritant. He put in more drops, and without warning, the whole world turned yellow. My right eye streamed from the drops and the left one streamed in sympathy. Then the eyedrops started leaking out my nose. I didn’t realise this at the time. I thought it was just a watery drip brought on by all the other irritation going on in the general area. The doctor was still examining me under his huge magnifying lens and I couldn’t grab a tissue. So I opted for a sneaky little nose-blot with my sleeve. That’s how I realised the nose-drip was actually eyedrops. I was still cursing my stupidity when the doctor told me to go to the eye hospital. I had an important appointment that afternoon and told him I’d go after that. His answer was emphatically no. 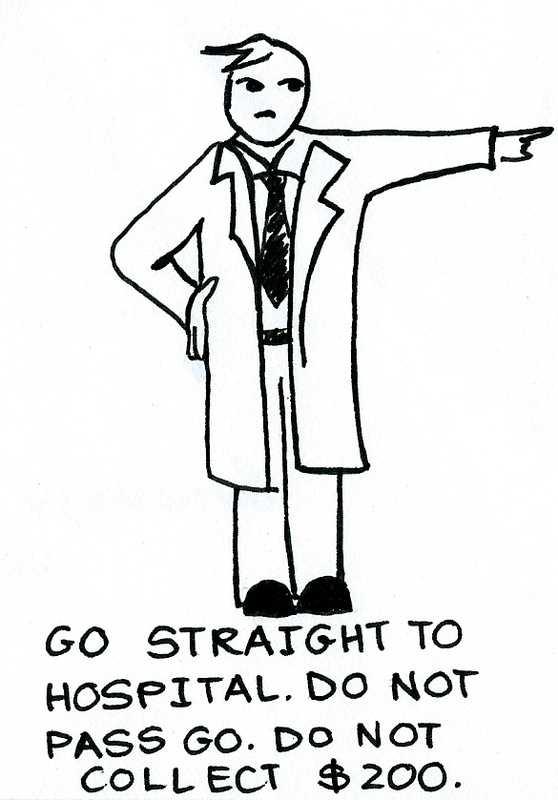 He explained that he’d found what looked like a “dendritic ulcer” – an indication that I might have herpes. In my eye. Inside my head, the little me that steers the meat-mass of my body was screaming like a maniac. On the outside I hastily erected a facade of near-comatosed calm and asked for clarification. The doctor explained that a typical scratch on the cornea would be a fairly clean line, but mine had lots of little branches on it – characteristic of eyeball herpes. At this stage my eyes must have bulged under the strain of remaining composed, because he added that he couldn’t be sure – he didn’t have the specialised equipment to view my eye properly. Again, he firmly encouraged me to go straight to the eye hospital. 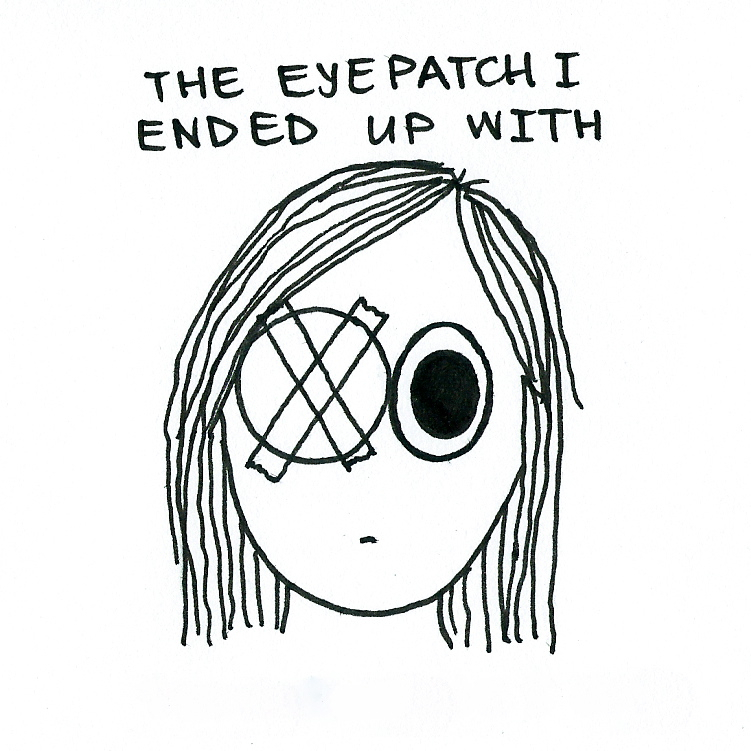 Then he wrote a referral, put a stupid big patch on my eye (not even a cool piratey one) and sent me off on my mission. On the train on my way to the eye hospital, I googled “herpes” and “eye”. It turned out that the offending virus is the one that causes cold sores on your lips, not the one that creates problems in your pants. Still, that was no consolation when I read that 10 per cent of sufferers will lose their sight from it. And the remaining 90 per cent will retain sight that might just make the grade for a driver’s licence. On top of this, herpes doesn’t go away. It remains dormant in your body forever – except for the notable occasions when it decides to come out and party some more, causing further damage to your eye. 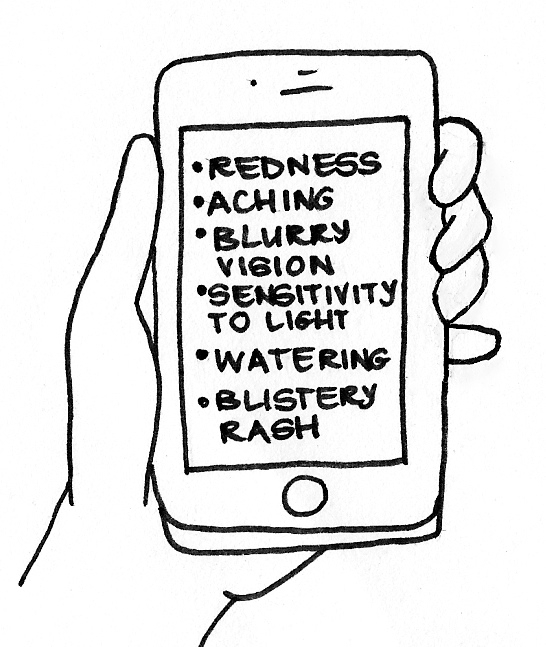 I hastily scrolled to the symptoms. This was actually Quite Reassuring, because I realised I barely had of them. So 75 per cent of me was now thinking, I’m fine, just another one of those false alarms my body throws at me, where it threatens a Really Serious Ailment, but turns out to be Just Kidding. Like the tiny little melanoma that could have been fatal if I’d nurtured it to maturity – but since we nabbed it in infancy, only resulted in annual appointments with the skin specialist for the next decade. Or the virus of “unknown etiology” that incited an emergency tracheostomy, then slunk off never to return. At the hospital, I waited. As tedious as this was, it helped calm me down. 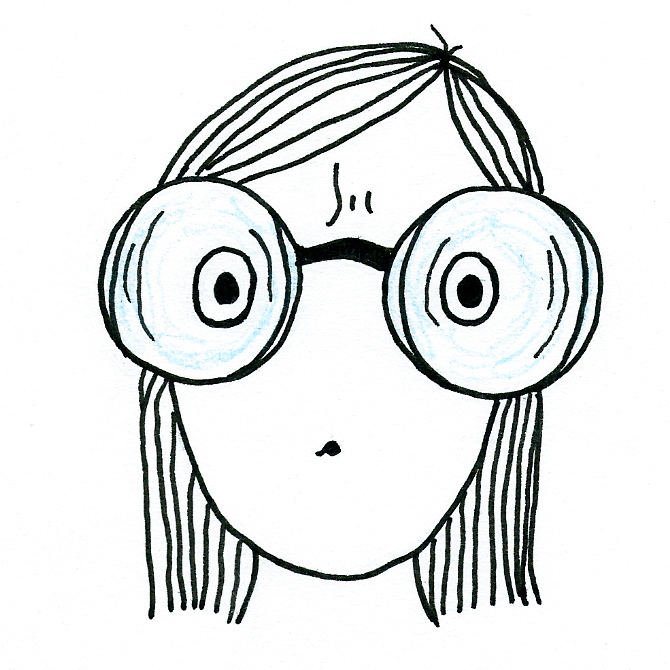 Finally I saw a technician, then an ophthalmologist – both of whom made reassuring noises and prodded my eyeball some more. They put in some dilatory drops that felt like a razorblade slashing my eye jelly. Then they were done – sending me off with a tube of antibiotic cream and some bored words about a slightly infected abrasion. Two hundred dollars poorer, and a hell of a lot sorer from all of the foreign substances and poking. But I had absorbed my lesson in gratitude: I was not going to go even a little bit blind, and I’d acquired a fiendishly hideous visage just in time for Halloween. 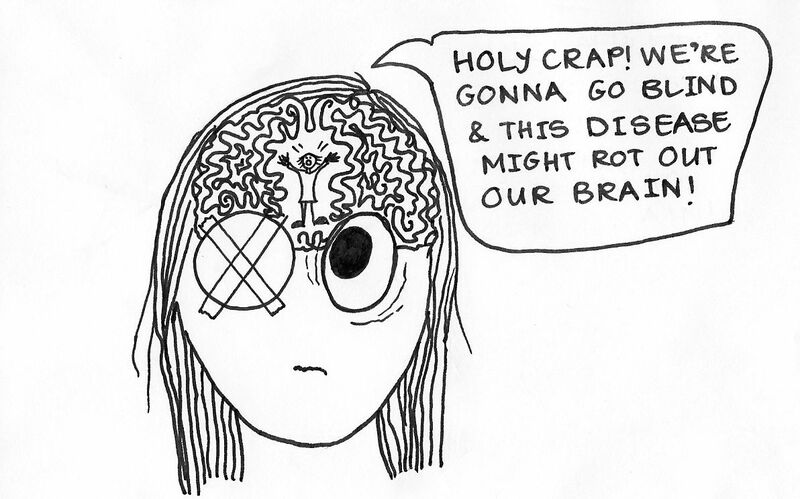 This entry was posted in Comics and drawings, The big bag of crazy and tagged eyesight, gratitude, humour, WPLongform. Bookmark the permalink. Whoa – that sounds horrendous! 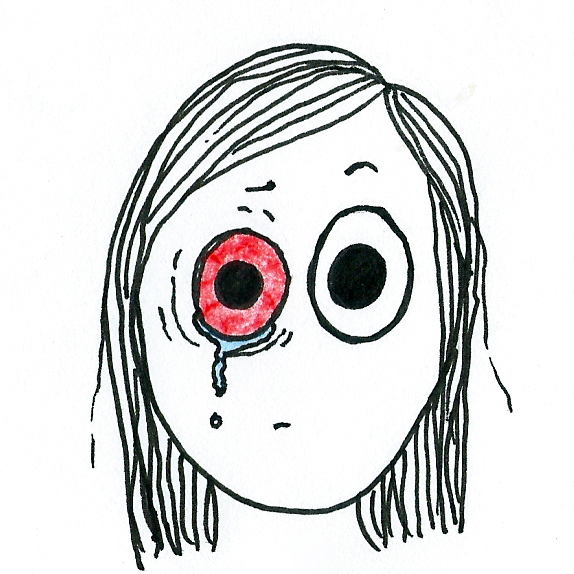 I’ve had to go to accident and emergency twice with contact lens issues – i.e. 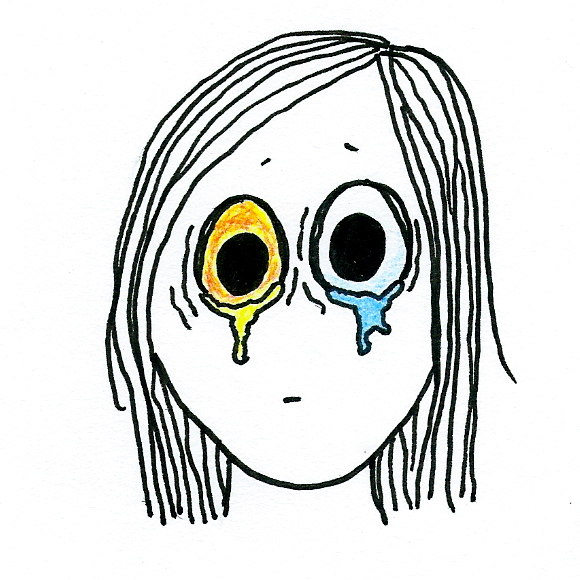 the bloody things breaking in my eye – and I had that lovely yellow dye the first time. Thankfully, though, the dye had the welcome side effect of making the sliver of broken contact lens just pop out before the doc had to get to work with the tweezers. Result. It never occurred to me that contact lenses could break like that! I was holding my breath reading about it, worried how it turned out for you. I’m glad it was okay in the end, but it sounds frightening and nasty! I snorted in the library. Oh no! Those are the kind of experiences I wish no one else had to share. I’m glad you recovered from both, paving the way for more auspicious days of pantslessness and etiquette-free driving! 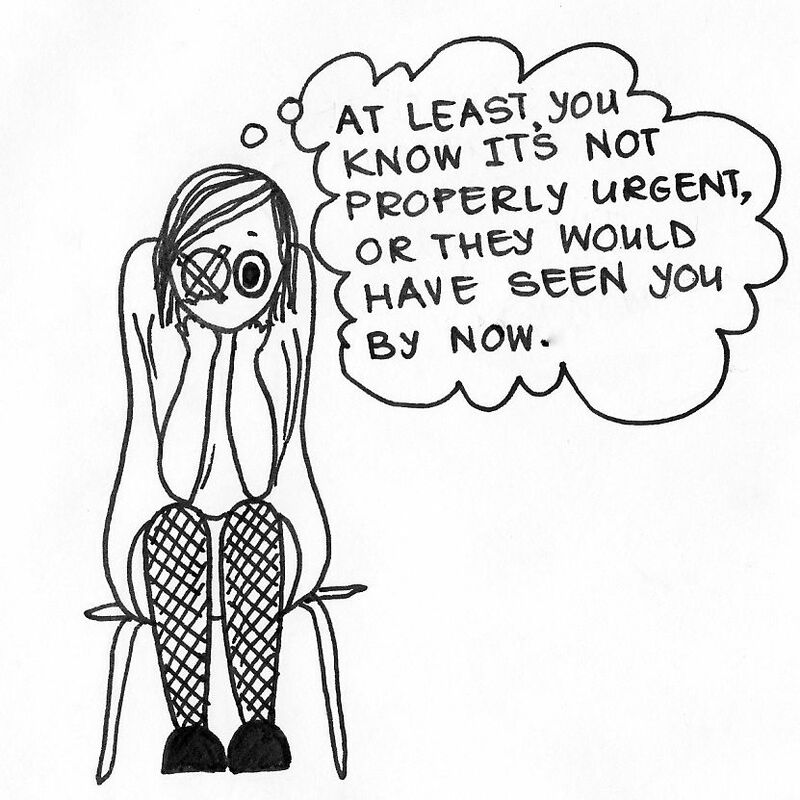 Agh eyes are just the worst. Who needs em? Do you think Dare Devil would have lost a lot of intimidation points if the reason he was blind was because he had herpes of the eye? Anyway, glad to hear you’re doing better! That all sounds like a terrible time. Next time we give thanks to Cyclops after discussing our vision, yeah? P.s. What kind of pen do you use for your stunning self portraits? Heh heh. I think the movie already did a pretty good job of demolishing his reputation, but eye herpes would definitely have undermined his remaining cred! I use Unipin fine line markers (with 0.8, 0.5 and 0.2 nibs) – they’re made by Mitsubishi. Then I scrounge up whatever pencils I can find in my daughter’s pencil case if I need to colour in! Hope your throat is feeling better, too! When you mentioned the god of corneas in the first paragraph, I braced for the worst. But then I chuckled, and a chuckle became laughter. 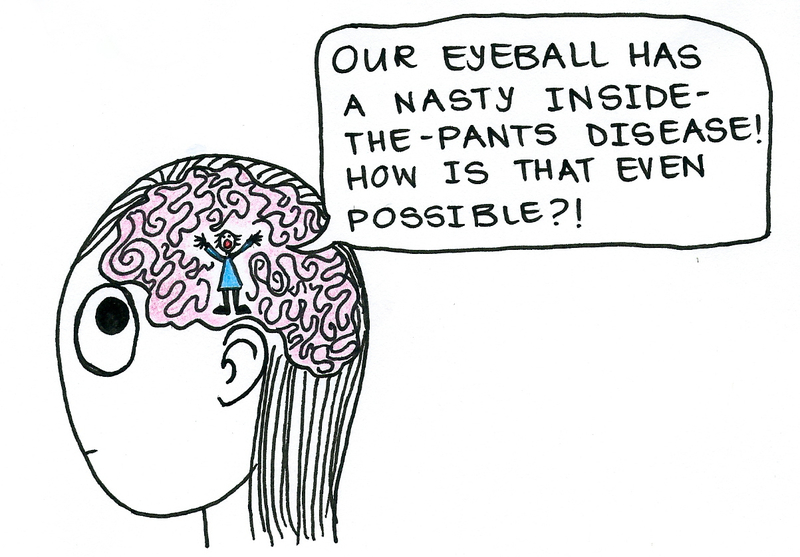 Then you talked about the pants stuff and … I didn’t know we could get herpes in our eyes. Your storytelling style and illustrations are so engaging. I’m glad your eyeball is healthy and there aren’t any immediate threats to your eyesight! Thank you! I’m so glad you made it past the corneas and got a laugh out of it. 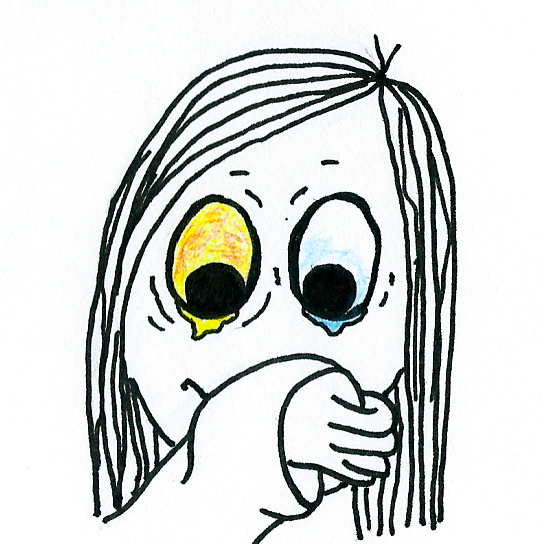 I had a long moment of hesitation before I hit publish – because as I scrolled through the finished product with all the drawings in place, I thought ‘Oh no! This looks gruesome. 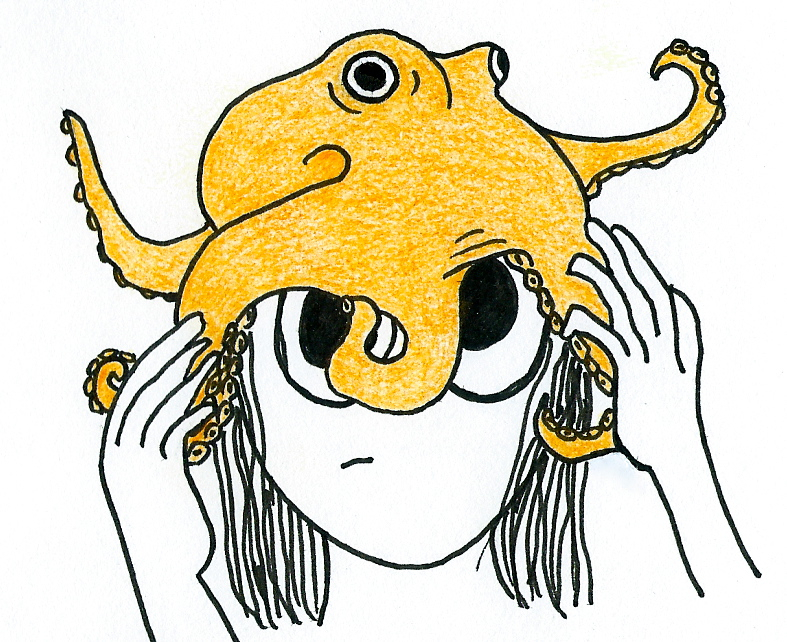 No one will want to read this.’ But then I looked at the silly orange octopus, and realised that if the story made one person smile just once, it was probably worth publishing.